With increasing number of air passengers every year, the aircraft lightning protection market garnered remunerations of around USD 2.5 billion in 2017, owing to the rise in total aircrafts being operated across the world. Although the last plane crash attributed to lighting was recorded long time back, most of the aircrafts are anticipated to endure at least one to two lightning strikes every year that can affect electronic systems onboard and their functioning. The aircraft lightning protection industry has enabled the integration of appropriate measures and protection materials to counter any damaging effects. Severe delays and costly service disruptions can be caused by lightning strikes if not equipped with protection systems, as most of the aircrafts are made of low-electricity conducting composite materials. 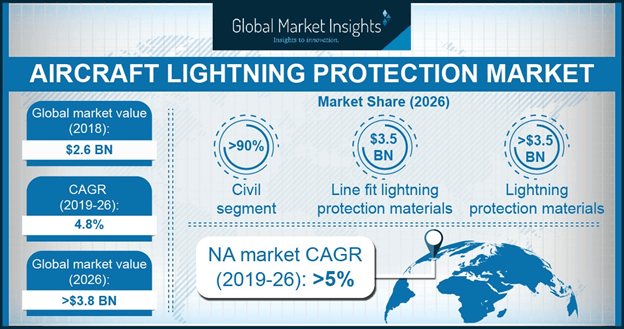 As composite materials provide a lighter and stronger alternative to deliver a reduction in overall aircraft weight and improved fuel efficiency, the aircraft lightning protection market will witness remarkable growth in the coming years. Higher consumer spending by the middle-class population has resulted from the rapid economic development worldwide, affecting the travel and tourism industry as a whole. Demonstrating the enormous potential for the aircraft lightning protection market, commercial airlines had carried approx. 4 billion passengers on scheduled flights in 2017. The International Air Transport Association (IATA) has predicted that by 2035, the air traffic figures could go up to 7.2 billion passengers, almost doubling from the present levels. According to IATA, a sizable chunk of this traffic will originate from the Asia-Pacific (APAC) region where China is pegged to dethrone U.S. as the biggest aviation market by 2024, and India is slated to capture the third place by overtaking the UK by 2025. Understandably, with a large portion of the region susceptible to harsh weather conditions, especially warmer areas that experience more lightning instances, the APAC aircraft lightning protection market may benefit from the demand for additional aircrafts. Global standards for passenger safety are also being strictly followed by airlines in the emerging nations of the region, where there has been a steady heave in disposable income over the years. The aircraft lightning protection industry has been greatly propelled in APAC region due to the fact that Asia boasts nine of the world’s ten most popular flight destinations. Boeing, as part of its own forecast spanning a twenty-year period, has projected that the demand for aircrafts will reach 39,000 globally and of these, 15,000 could be attributed to the Asian markets. There has been a significant upsurge in domestic air travel in APAC countries and apart from developed economies like Australia and New Zealand, China and India have seen a tremendous boost in regional flights. Referring to previous reports, China itself had added more than 110 domestic routes between 2015 and 2016 with the total number of airports, domestic and international, growing to 1,224 by 2016. As such, the APAC aircraft lightning protection market, which is expected to register a 6% CAGR from 2018 to 2024, will be a critical component of the regional aviation industry. Heightened competition amongst established and new airline companies have led to cheaper air fares and more efficient services, further reinforcing the domestic air travel segment. The aircraft lightning protection market will be given an immense thrust from retrofitting projects, where older airplanes would be upgraded with enhanced protection, detection and warning systems to ensure overall safety of passengers. Aircrafts also need to be maintained periodically and often require replacement of parts or modification of system components. A major contribution towards the aircraft lightning protection industry earnings could be realized from retrofits done during MRO (maintenance, repair and overhaul) services offered by OEMs as well as aftermarket servicing companies such as Lufthansa Technik, AAR Corp., among others. Recent predictions had indicated that through the next decade, about USD 114.7 billion would be spent on MRO services due to the swift increase in the jet fleet around the globe. Lightening protection as well as detection and warning systems are often required to be retrofitted during servicing of aircrafts and the obligatory presence of MRO service centers has guaranteed timely inspection of aircraft components. APAC has been coming up as a home to MRO centers of key aircraft manufacturers, such as Airbus, which has been expanding its MRO base in Asia with new partners like Triumph Aviation Services Asia. If similar trends continue for other manufacturers across the world, extensive availability and efficiency of MRO services offered will significantly bolster aircraft lightning protection market globally, which is anticipated to record a CAGR of 5% during the 2018-2024 timeline.